This is showing that the game (and the underlying familiarity algorithm that drives it) may have a bias toward classical musicians. One of the knobs we have in our familiarity algorithm is a boost for age of the artist (even though Beethoven doesn’t get played on the radio very often, most people have heard of him, so he gets a boost for being old). But this early data suggests that we are giving a bit too much of an age boost. Ideally, the most frequently confused artists would be spread evenly across genre. The fact that there are no Hip-Hop or Pop artists on this list suggests that our familiarity algorithm skews away from those artists. Looks like we’ll have a few knobs to tweak. Yep, someone scored -4656 points. If you take too long to answer you get dinged (to avoid the Wikipedia winner). 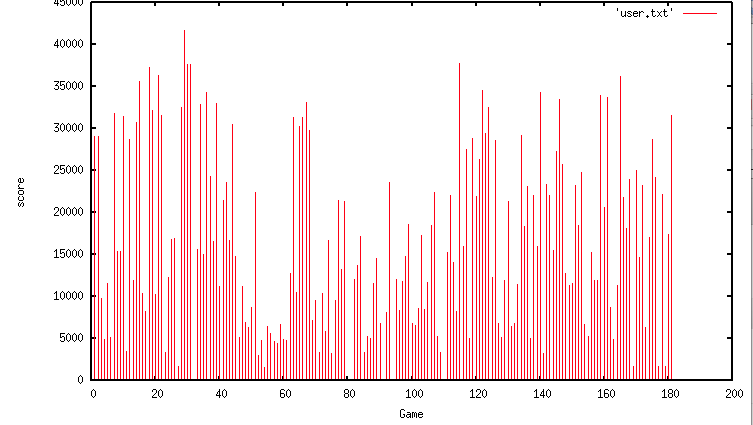 I was a bit concerned as to whether or not someone could ‘learn’ the game (my daughter Cari suggested as much), so I looked at the scores over time of one of the frequent players to see if the score trended upwards. There doesn’t seem to be any noticeable trend for this user, so it seems that the game is perhaps a good measure of general music knowledge and not a measure of how may times you’ve played the game. People are still playing the game – and there seems to be a good fight for the top spot on the leaderboard which means that I should continue to get good data. Next step is to tweak the familiarity knobs based on the data collected so far and update the game to see if the average scores go up. This entry was posted on July 11, 2010, 12:01 pm and is filed under code, fun, Music, The Echo Nest. You can follow any responses to this entry through RSS 2.0. Both comments and pings are currently closed. Firstly, great game! Thanks for providing some spare-time entertainment. I’m much more geeky about music than statistics, but I strongly suspect that the prevalence of classical composers not recognised is not so much to do with algorithm bias, and more to do with the particular music knowledge of the people playing the game. Could it be that most people who read blogs/play online games are young-ish people (who are usually more familiar with popular music than classical)? Grieg, Satie, Ravel, Mendelssohn – these are not obscure composers (if you’re into classical music). Anyway, great stuff! Thanks Weasel – glad you posted, was wondering who was chewing up the leaderboard. Agree that the game may have a bias toward the Internet crowd, but a familiarity function targeted at that crowd may not be such a bad thing considering that these are the same folks that are using online music engines. Hard to say for sure. Hey. I like this game a lot. However, maybe the time limit could be a little shorter, because I was able to look up the artists on the net. Thanks for the machines! I agree that your crowd is just biased to non-classical music. I can readily identify the classical composers in the list above, and Mendelssohn, Vivaldi, and Ravel are hardly obscure (and Grieg and Satie aren’t so strange either). Dinah Washington does suggest you’re skewing young. Heck, I’ve heard *of* her but can’t swear to have *heard* her. When I first started reading the description of this game I thought it would be a “Name That Tune” type game. But I like it a lot. I was curious about the learning curve idea, too; I found that I was getting a bit father in successive rounds based on what I’d learned from previous failures, essentially building up a small stable of new-to-me artist names that I could rule out on replay. But that seems like it wouldn’t scale well — just how many novel artist names can I keep in my head over the short (let alone long) term without any kind of point of reference like actually hearing their music and identifying it with the name? So I’m not surprised you didn’t seem much effect when you took a look. I do wonder if there’d be a measurable initial-onset effect for any players first few games, though, as they manage to grab a few new artist names as hedges from round to round.